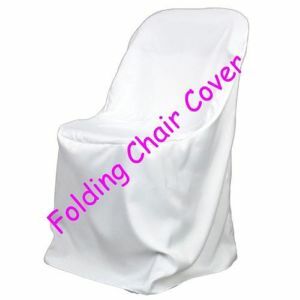 New White polyester folding chair covers. These chair covers are made from 100% Polyester and are wrinkle and stain resistant, machine washable. Perfect for a wedding, party or special occasion. We recommend using a steamer to remove any stubborn wrinkles. This listing is for the chair cover only. Picture of chair is just to show you what type of chair this cover fits on. Shipping is $7.99 no matter how many chair covers are ordered. Seat height from ground (Front, Back) 17.25 in, 16.75 in.